LOS ANGELES – Seeking to stop financial predators who exploit immigrants looking to establish U.S. residency, the Los Angeles County Board of Supervisors voted Tuesday to support state legislation to bolster protections against such fraud. Supervisor Hilda Solis recommended going after “notario fraud” by individuals posing as licensed attorneys, despite a lack of training, and offering immigration advice. 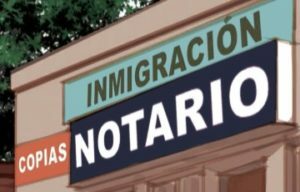 In some Latin American and European countries, “notarios publicos” have educational training and professional duties similar to lawyers. However, in the U.S., a notary public can only witness signatures and translate forms and is not allowed to give legal advice. That doesn’t stop some notaries from operating illegally, sometimes marketing themselves as a more affordable option to hiring a licensed attorney. Gaining trust by speaking an immigrant’s native language, scammers often incorrectly fill out important paperwork or fail to complete forms at all. Others overcharge clients or steal money. Victims may be unfamiliar with laws against the practice or afraid to speak out for fear of deportation. Imelda Miranda Martin, a U.S. citizen, reached out to notario Oswaldo Cabrera for help in establishing legal residency in the U.S. for Martin’s two sons. Miranda Martin worried when Cabrera immediately pressured her to pay up to $15,000. Because she had saved and borrowed only $4,000, the woman had to choose which of her two sons to help. Shortly after she paid him, Miranda Martin learned that Cabrera had been arrested. Cabrera was sentenced to five years in prison for defrauding immigrants and Miranda Martin recouped her $4,000, though her sons still lack resident status. Solis said residents can report fraud to the Department of Consumer and Business Affairs without fear of retaliation. “We want all county residents defrauded by notarios to be reassured that they can safely report their cases to us. The county offers free services and can connect fraud victims to appropriate legal aid providers,” Solis said. The board directed the Office of Immigrant Affairs to launch a public awareness campaign to help residents identify, prevent and report fraud in immigration services. 1 comment for "L.A. County looks to strengthen consumer fraud protections for immigrants"